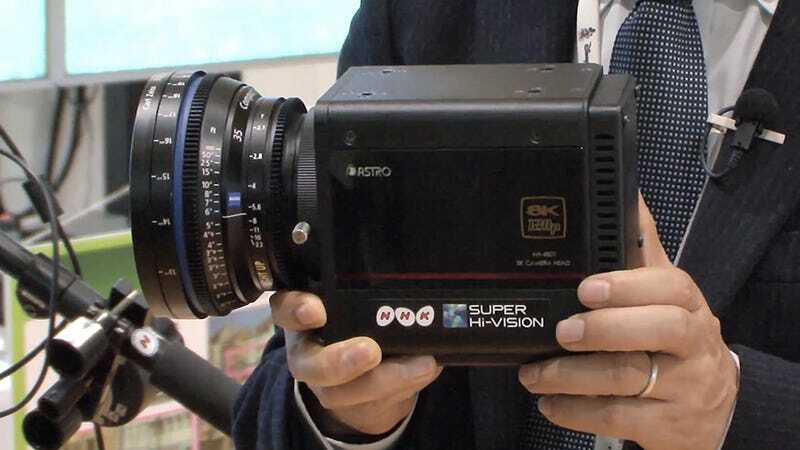 The shrinkification of technology is as inevitable as death and taxes, but we still can't help but be excited to see that Japan's NHK, working with a company called Astrodesign, has managed to shrink an 8K-capable camera into this relatively compact package. Compared to the HD-capable smartphone in your pocket it's monstrous, but when put next to existing Ultra HD cinema cameras believe it or not this is tiny. The secret to the 8K camera's trim figure is a 33-megapixel sensor that's just under an inch in size, so all of its components are able to squeeze into a housing that's about four inches square. Its compact form factor also allows smaller, lighter lenses to be used, which will eventually help bring the cost of 8K production down so the next-gen format has a better opportunity to catch on.